Martha thanks Evelyn for the letter for her birthday, and describes how her birthday was spent on the mountain with the other students. 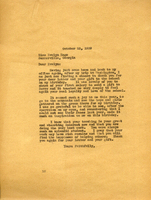 Martha Berry talks about activities that occurred for her birthday after thanking Mrs. Ford for her telegram. She also talks about her appearance on a radio broadcast and how excited she is that she finally has her glasses after the surgery on her eyes. She concludes with the hope that the Fords will visit Berry soon. 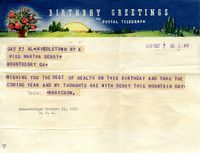 In this telegram Mary Crow wishes Martha Berry a happy mountain day. 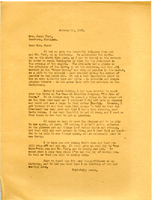 In this telegram addressed to Martha Berry at Atlanta's St. Joseph Hospital, Henry describes the Mountain Day Grand March, which was perfect with the exception of Berry's absence.